For the fourth time in our history, we've put a red X over a face on our cover. 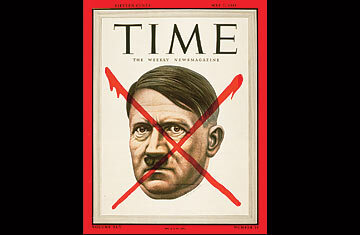 The first time marked the death of Adolf Hitler in 1945. In 2003 we revived the X for Saddam Hussein on the occasion of the U.S.-led coalition's takeover of Baghdad. Three years later, we put it on the face of Abu Mousab al-Zarqawi, the scourge of Iraq. Now we use it to signal the death of the world's most-infamous terrorist, Osama bin Laden. Bin Laden's death is the bookend to an extraordinary decade that began with the 9/11 attacks. He lived in our imagination, in our fears and, as it turns out, in a quiet suburb of Islamabad. His death comes at a time when his influence was at a low ebb. In all the conflicts and victories of this riotous Arab Spring, no one has been chanting his name or carrying his image. But in a curious way, his death brings him back front and center, if only for a moment. It is the end of an era in some ways, but not the end of our struggle against terrorism. This special issue is rich with stories and images that explore the historic events of the past few days and reckon with what they presage for the future. David Von Drehle tells the tale of the patient hunt and risky choices that ended in a stunning military success. Joe Klein sees the decision to send in the Navy Seals as emblematic of President Obama's distinctive style as Commander in Chief. Fareed Zakaria, who famously asked, "Why do they hate us?" after 9/11, is optimistic that al-Qaeda is no longer an existential threat. Peter Bergen, who met bin Laden in Afghanistan in 1997, argues that the 9/11 attacks were the beginning of the end for the terrorist. Nancy Gibbs, who wrote the cover story for our 9/11 issue, examines our complicated reactions to bin Laden's death. Former New York City mayor Rudy Giuliani speaks of the powerful emotions still raised by 9/11. Aryn Baker, our Pakistan and Afghanistan bureau chief, looks at the tricky road ahead for Pakistan. Massimo Calabresi scores the first interview with CIA Director Leon Panetta following bin Laden's death and explains how the agency has changed since its low point a decade ago. But perhaps the most poignant words in this issue come from three of the children who were reading The Pet Goat with President George W. Bush in their second-grade classroom when Bush learned that the U.S. had been attacked. These kids, now high school juniors, had a front-row seat to history. Our news director Howard Chua-Eoan asked Miami bureau chief Tim Padgett to track them down. Lazaro Dubrocq, 17, remembers seeing the President's horrified expression and recalls how his heart started racing. That day in the classroom had a lasting impact, Dubrocq says: it "motivated me to get a better handle on the world and to want to help improve the world." That goes on, even with bin Laden gone.